Heat oven to 350°F. In large bowl, beat eggs. Stir in all remaining meatloaf ingredients. Press mixture in ungreased 8x4-inch loaf pan. Bake at 350°F. for 40 minutes. Meanwhile, in small microwave-safe measuring cup, combine all glaze ingredients. Microwave on High for 1 to 2 minutes or until jelly is melted, stirring every 30 seconds. Remove pan from oven. Using pancake turner to hold meatloaf in pan, drain off fat. Spoon glaze over meatloaf. Return to oven; bake an additional 20 to 25 minutes or until meat thermometer inserted in center reads 160°F. Let stand 5 to 10 minutes before serving. Assemble the meatloaf, then cover and refrigerate for up to one day. Uncover; bake glaze as directed in the recipe. Add 10 to 15 minutes to the bake time. 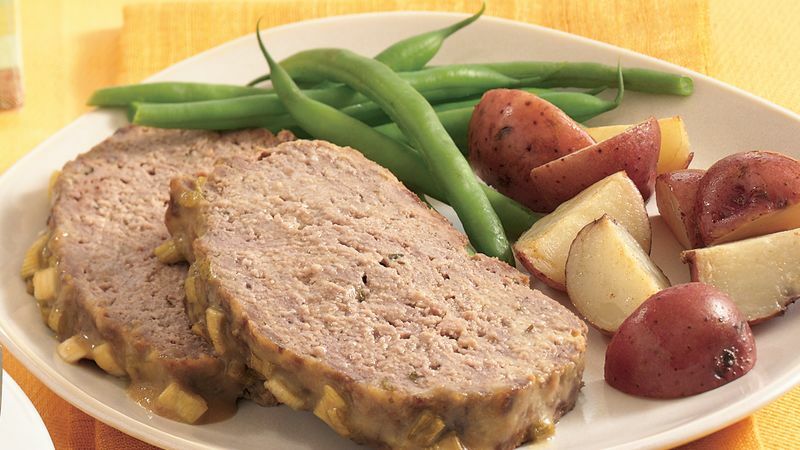 Serve slices of this meatloaf with buttered new potatoes and fresh green beans. Top the meal off with sliced fresh peaches and whipped cream.